The Aprilia Futura is equipped with 43mm Showa front forks* and a Sachs rear shock, both adjustable for preload and rebound only. The forks are similar to those fitted to RSVs, Tuonos and Falcos of a similar vintage, except the compression adjuster is blanked off and the other bikes mounted larger diameter front discs. 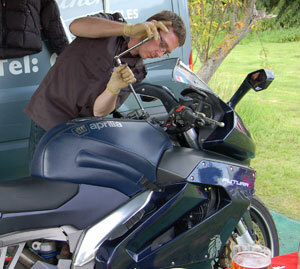 Fitting forks and brake discs from other Aprilias is quite a common modification. Issues surrounding the rear shock and replacement are dealt with on the rear shock page. Front preload is set using the rings at the top of the forks with a 22mm spanner or socket, while rebound is done using a screwdriver. Rear preload is adjusted using the knob on the left of the bike, and rebound via the screw at the base. In short it’s easy to do. The owner’s manual – you can download a copy from the link on the right – lists several different options for suspension settings, but owners who have tried them have generally not been impressed. The best way to set up the suspension is to set the static sag at each end and work from there. This is done by setting front and rear preload, then experimenting with rebound damping. Suspension set-up is something of a black art. Here’s a guide that, while not specific to the Futura, gets the idea across. As ever, if you know of a better online guide, then get in touch. See also the page on servicing the front forks. *Some countries, Ireland, for example, got Marzocchi forks instead of Showa kit and these have suffered from severe corrosion after winter use.